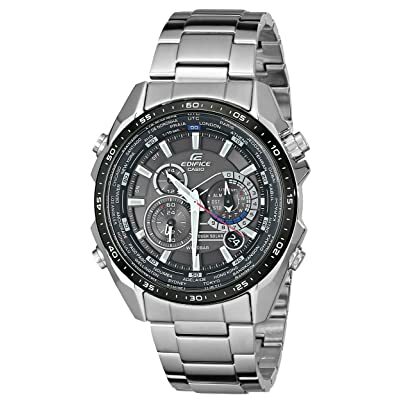 In today’s marketplace, when it comes to men’s affordable watches of excellent value, we can’t miss products from Casio- one of the famous high-tech Japanese brands with specialized watches for any type of lifestyle. And if you are a watch lover or intend to own a wonderful watch from this famous brand, don’t hesitate to consult our reviews here. Our article will provide you with some helpful information, and high-ranking recommendations relating to best Casio watches for men on the current market. Based on those, you may determine which one best fit your needs. Now, read up on to get necessary information about models belongs to three typical series of watches manufactured by Casio and then getting an appropriate one. G-Shock is the most popular watch series by Casio until now. They are well-known for water as well as mechanical shock and vibration resistance. They are the perfect blend of function and fashion, which allows G-shock watches to fit any lifestyle and fill the demand for durable and reliable watches. Most G-shocks are digital, or a combination of analog and digital. They always have a stopwatch feature, countdown timer or electroluminescent backlight. This line is designed primarily for sports, military forces and polices and outdoor-oriented activities. This watch is highly appreciated by customers who are the outdoorsy type, especially the special forces in the challenging enviroments. Those who enjoy backpacking and trekking rate it as a perfect partner, too. Casio Mudmaster also has lots of different colors for you to choose. All of them are cool-looking in their own ways. It is rated as a well-built watch with its impressive features and the high quality of extremely durable materials. Its thermometer and compass features are also great bonus points. In particular, it features crystal-clear mineral glass lens, full auto-calendar, 5 daily alarms, 1/100-second stopwatch, world time, countdown timer as well as great battery life. Besides, its analogue and digital display allows users to watch time more conveniently. In addition to its rather powerful proportions, the bulky case and five buttons stand out upon first interaction of users with this watch. The wide, easy to find and press-checkered surface pushers also make it hard to break when being underwater, muddy or experienced a few hard knocks. On the other side, a few users still hesitate to buy it because of its thickness. Anyway, if you don’t pay much attention to that, this watch will bring you the excellent wearability in other aspects. For instance, the integration of the resin straps together with intelligently designed lugs and a flat case back allows the watch to sit flat on your wrist. In a word, this round-shaped watch is a very comfortable and durable product with the sturdy looks and touch. If you are interested in this product and are fine with thick watches, don’t hesitate to own one with the not low but affordable price. We presume it will please you immediately. This model of Casio’s G-Shock series will be a perfect match for any outdoor enthusiasts because of its huge number of sensors and features. Those people can be military, survivalists, hikers, hunters, campers, climbers, bikers and many other ones. This watch is designed to withstand all sorts of shocks and bad treatments from their active life. Particularly, it’s one of G-Shock Tough Solar models to be equipped with a triple sensor including a digital compass, altimeter, barometer and thermometer, which is ideal and indispensable for an outdoors excursion. Other great features such as sunset and sunrise times, Multi-Band 6 atomic timekeeping, time stamp, 4 alarms, auto-LED backlight, 1/10 second stopwatch, countdown timer, calendar, solar power are also in this super tough watch. About the design, it has an attractive look and aggressively bulky appearance with the band and case made from high-quality black resin together with red and gray accents. Besides, there is also the version with eye-catching classic army green. Although some users suppose that it’s quite big on their wrist size, it fits well and is very comfortable at about 93g. 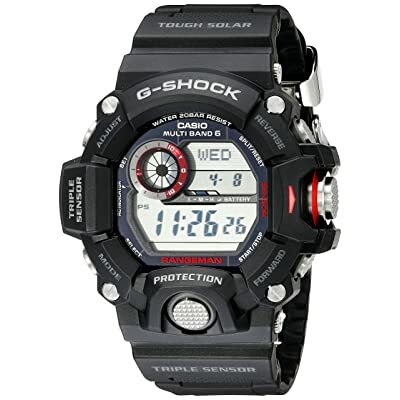 Like many other G-Shocks, it features a protective mineral crystal dial window. After all, this Triple-Sensor watch from Casio’s G-Shock is an exciting timepiece with many new features. So, why don’t you purchase this affordable and classic G-Shock watch? This product line is also digital watches like G-Shock but serves a different purpose. While G-Shocks are extremely tough to withstand the most intense physical abuse, Protreks focus more on advanced features in outdoor adventures. The robust models of Protrek series are supposed to be perfect for outdoorsmen who enjoy traveling, hiking, fishing, trekking, skiing, cycling or water sports activities. They both feature the authentic outdoor styling and have distinguished tools to support the travel. They are also equipped with sensors that allow you to observe the nature and monitor its changes. 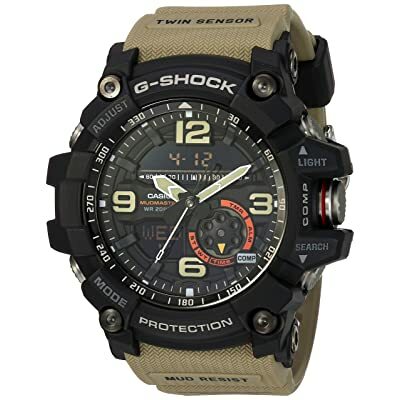 In general, the toughness of Protreks is a little bit lower than that of G-Shocks, but it is still strong enough to replace the G-shock in most cases. This rugged Protrek is suitable for both outdoor and daily use thanks to its high-contrast, simple dial format, and slim (13.5mm) designs. It also packs highly fashionable designs and plenty of high performance. This round-shaped sports watch easily attracts the users through its great exterior and many interesting features. It has a black IP stainless steel bezel, reverse STN LCD, and a black silicone band as well as large Arabic numeral hour markers. 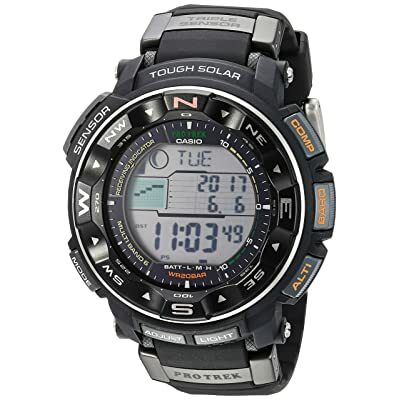 Other great features of this solar-powered watch include the double LED light, luminous hands and markers, altimeter data memory, world time, low-temperature resistance, stopwatch, countdown timer, 5 daily alarms, automatic hand adjustment, hand moving function, battery level indicator, and 12/24-hour mode. With so many features, it sometimes becomes fairly complicated for few customers to use. Anyway, being patient to know more about it will bring you wonderful experiences. Overall, this product is lightweight (about 77g) and comfortable to wear. The minimal design also makes it perfect for users with small wrists. This PRG-600Y-1CR has proved itself as a stylish, surprisingly tastefully designed wristwatch, especially for people who lead an active lifestyle and need a perfect time measuring device during the outdoor expedition. It’s worth owning! The bezel ring looked like metal but made of plastic in reality. Pro Trek PRW2500R-1CR is highly rated as a high-performance watch to tackle the difficult and challenging environments. Many users, especially those who are in trekking or stream and river crossing, enjoy this adorable watch with its high-quality items and great water resistance. 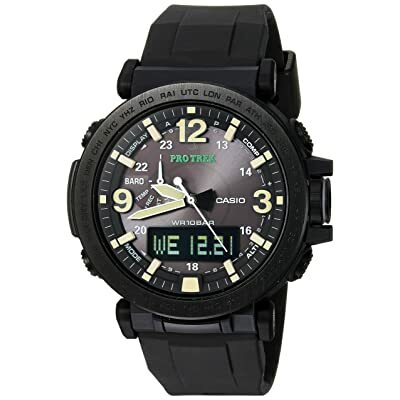 Particularly, its outstanding feature is a digital time, date, tide graph and moon data display with unique arrow icons that supply useful knowledge for many activities such as sea kayaking, fishing, river hiking and much more. A reconfigured duplex LCD layout that brings gold standard higher for info at-a-glance is also a big point here. You may see more specifications of this watch shown in the table below. Besides the great quality, this extremely rugged model has its black resin band with neutral face to make it tough, unobtrusive and long-lasting. Although some users think it easily scratched after a long time, I think the reason is their lack of carefulness and abusing it too much. In a word, strong features, good prices and beautiful styles of this stunning watch make it popular. If you are active and like to explore, this will be the best choice for you. 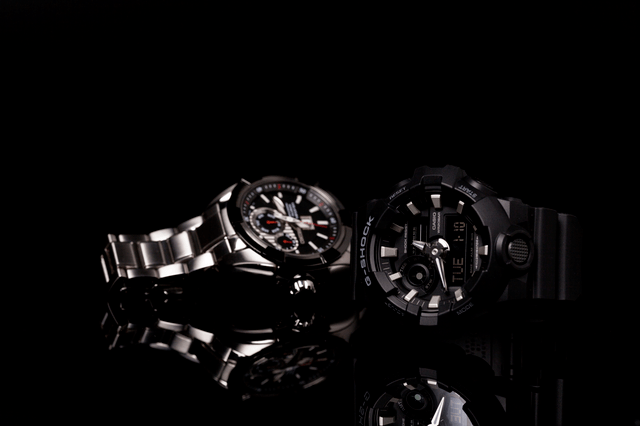 While G-Shock is more towards the outdoor type of watch, Edifice series are created for casual or daily use by men. This Casio’s line boasts a wealth of technology such as Bluetooth synchronization, multi-layered dials, smart crown access and world-time adjustment, which fairly appeals to the suits. Moreover, it displays a distinct sense of style with features that are ideal for professional and weekend lifestyles, from the boardroom to the ballpark. With many aristocratic, sleek styles, each model shows off its attractive and sophisticated look for male. This model is stylish for casual or everyday use. It is equipped with solid stainless steel case and mineral glass as well as fully packed with numerous functions that other watches at the same price don’t try to include. I’m using this watch on a daily basis, and it’s not too big, at just 12.3 mm thick. And its three-link stainless steel bracelet straps it to the wrist well. I think it is the sophisticated, manly and stylish look for a casual, trendy watch. Anyway, you may need much time to learn all its functions well. On the other hand, I surely you will see amazing things. This hi-tech watch features chronograph, Day & Date display, full auto-calendar, storage battery, beeper alarm, World Time, Tough Solar Power, 100m water resistance, power saving function and such many other amazing specifications to make it perfect. 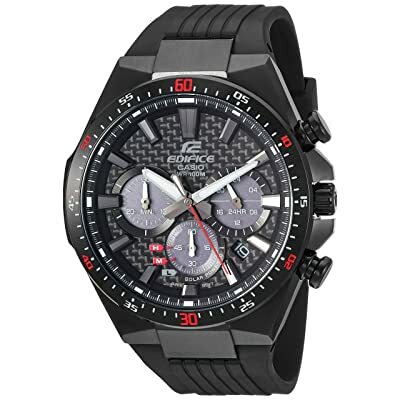 If you like this hi-end Casio Edifice, consider purchasing it at Amazon for a great discount. I’m sure it will not make you disappointed. For many users’ reviews, the design of this watch is suitable for casual and daily use. It is fairly sharp and impressive with the resin band, black ion-plated case, and carbon fiber face. In addition, this solar-powered model is functionally featured with the screw lock back, 1-second stopwatch, battery level indicator, date display, regular timekeeping, 100m water resistance, buckle closure and more specifications mentioned below. In a word, this analog type is great for you to wear even on a daily basis. This is worth it! You can purchase one on Amazon to have a great deal. Those are the best Casio watches for men I would recommend you. They are durable, reliable and will serve your need better. They are all available online at an affordable price. Thus you can always find your favorite option. Now, consider for your exact budget and what you need to have the right choice.